Our Round 4 Feature Match features a Zefra Duelist! Zefras won the UDS Invitational in Sacramento a few weeks ago. Kevin Adams from Taylorsville, Utah is using Zefras this weekend, and is featured in our Round 4 Feature Match! 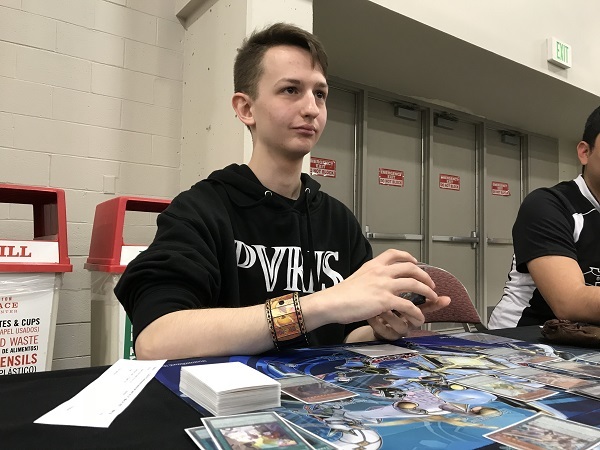 He’s Dueling against Sean Sandoval from Albuquerque, New Mexico and his Pendulum Magician Deck. It’s time to Duel! Sandoval won the roll and elected to go first. He started with Dragon Shrine, sending Supreme King Dragon Darkwurm to the Graveyard. Its effect Special Summoned itself and its other effect added Supreme King Gate Zero from his Deck to his hand. He then Normal Summoned another Supreme King Dragon Darkwurm and used the two monsters to Link Summon Heavymetalfoes Electrumite! He used the first effect to send Astrograph Sorcerer from his Deck to his Extra Deck. He then activated Rescue Hamster in the Pendulum Zone and Heavymetalfoes Electrumite used the effect to destroy the rodent and add Astrograph Sorcerer to his hand. He Special Summoned the Sorcerer with its effect and added another Rescue Hamster from his Deck to his hand. He then drew a card for Heavymetalfoes Electrumite’s other effect. Next, he activated Rescue Hamster and used the Pendulum Effect to banish it to add both Darkwurms in the Extra Deck back to the hand. He then activated Supreme King Gate Zero and Harmonizing Magician to the Pendulum Zones, then Pendulum Summoned Rescue Hamster from the Extra Deck along with both Darkwurms and another Rescue Hamster from the hand. He used both Hamsters to Link Summon another Heavymetalfoes Electrumite, whose effect sent another Astrograph Sorcerer from his Deck to his Extra Deck. He used Electrumite’s effect to destroy Harmonizing Magician and add Astrograph Sorcerer to his hand, and Special Summoned Astrograph to add another Harmonizing Magician from his Deck to his hand. He used both Darkwurms to Xyz Summon Evilswarm Nightmare, then used both Heavymetalfoes Electrumites to Link Summon Zefra Metaltron. He then used both Astrograph Sorcerers to Xyz Summon Odd-Eyes Absolute Dragon and passed. Adams started with a hand of Performage Hat Tricker, Chronograph Sorcerer, Ritual Beast Tamer Zeframpilica, Timegazer Magician, Zefra Providence, and Zefra War. He activated Zefra Providence, adding Oracle of Zefra to his hand. He used Oracle’s effect to add Zefraath, which he placed into the Pendulum Zone. He used its effect to send Zefraniu, Secret of the Yang Zing from the Deck to the Extra Deck. He then activated Ritual Beast Tamer Zeframpilica and then activated Zefra War to destroy his own Oracle and Sandoval’s Evilswarm Nightmare. 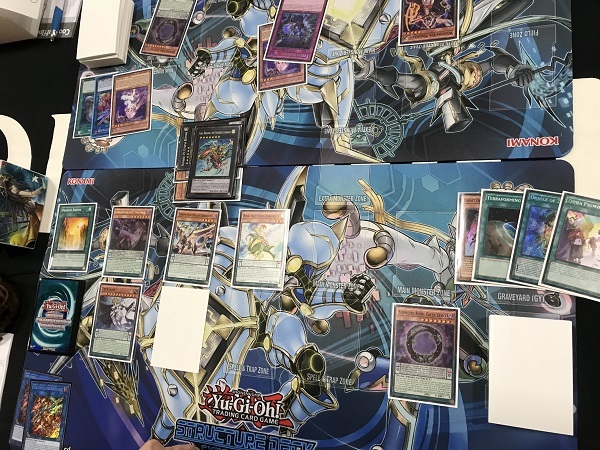 He then Pendulum Summoned Zefraniu, Secret of the Yang Zing from the Extra Deck and used its effect to add another Zefra Providence from his Deck to his hand. He then Normal Summoned Timegazer Magician and used both monsters to Link Summon Heavymetalfoes Electrumite. He used the Link Monster’s effect to kick Satellarknight Zefrathuban from the Deck to the Extra Deck. Heavymetalfoes Electrumite’s effect destroyed Ritual Beast Tamer Zeframpilica and added back Zefrathuban. He then activated Heavymetalfoes Electrumite as Chain Link 1 and Chronograph Sorcerer as Chain Link 2. He Special Summoned it and Zefathuban and drew Rank-Up-Magic Argent Chaos Force. He then Special Summoned Performage Hat Tricker and used Zefrathuban and Hat Tricker to Xyz Summon Number 39: Utopia, then used it to Xyz Summon Number S0: Utopic ZEXAL! Sandoval drew for turn and Adams used the effect of Utopic Zexal to stop Sandoval from activating any cards or effects this turn. He Set a monster and a Spell/Trap and passed. Adams drew Terraforming. He activated it, adding another Oracle of Zefra from his Deck to his hand. He activated that, adding Zefraath from his Deck to his hand. He then activated Zefraath and used its effect to kick Stellarknight Zefraxciton from his Deck to his Extra Deck. He then used Heavymetalfoes Electrumite’s effect to destroy Chronograph Sorcerer to add Stellarknight Zefraxciton from the Extra Deck back to his hand. Adams then used the effect, destroying Sandoval’s Set Instant Fusion and protecting his own Oracle of Zefra by banishing a Zefra Providence from the Graveyard. He then activated another Providence, adding Zefraxi, Treasure of the Yang Zing to his hand and putting it in the Pendulum Zone. He then Pendulum Summoned Ritual Beast Tamer Zeframpilica from the Extra Deck. He used its effect to Special Summon Satellarknight Zefrathuban from the Graveyard. He used Ritual Beast Tamer Zeframpilica and Satellarknight Zefrathuban for another Heavymetalfoes Electrumite, whose effect sent another Chronograph Sorcerer from the Deck to the Extra Deck. He used that effect to destroy Zefraxi and add back Chronograph Sorcerer. He Special Summoned Chronograph Sorcerer and drew Supreme King Gate Zero for Heavymetalfoes Electrumite’s effect. He then used Heavymetalfoes Electrumite, Chronograph Sorcerer and Zefraxction to Link Summon Borreload Dragon. Number S0: Utopic ZEXAL attacked the face-down monster, destroying Sandoval’s Harmonizing Magician. Borreload attacked and stole Sandoval’s Odd-Eyes Absolute Dragon. Heavymetalfoes Electrumite attacked directly. Sandoval drew for turn and conceded the Duel there. Sandoval elected to go first in Duel 2. He started off with Foolish Burial, sending Supreme King Dragon Darkwurm to the Graveyard. Its effect Special Summoned itself and added Supreme King Gate Zero from his Deck to his hand. He then Normal Summoned Purple Poison Magician and used the 2 monsters to Link Summon Heavymetalfoes Electrumite. It effect activated, but Sandoval Chained Ghost Ogre & Snow Rabbit to destroy the Link Monster. The effect sent Astrograph Sorcerer to the Extra Deck anyway. He then activated Mythical Beast Bashilisk. He used the effect to shuffle the Purple Poison Magician in his Extra Deck back into the Deck to draw a card. 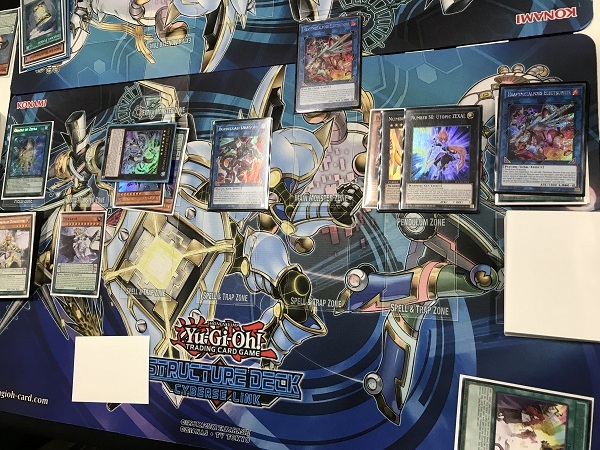 He then placed Wisdom-Eye Magician and Supreme King Gate Zero in the Pendulum Zones then Pendulum Summoned Supreme King Dragon Darkwurm from the Extra Deck. He passed there. Adams started off with Terraforming, Chronograph Sorcerer, Zefraniu, Secret of the Yang Zing, Zefraath, and Oracle of Zefra. He activated Terraforming, adding Dragon Ravine from his Deck to his hand. He then activated Oracle of Zefra to add Ritual Beast Tamer Zeframpilica from his Deck to his hand. He then activated Dragon Ravine over Oracle of Zefra, then used the effect, discarding Zefraniu, Secret of the Yang Zing to send Supreme King Dragon Darkwurm to the Graveyard. He then Special Summoned Supreme King Dragon Darkwurm and added Supreme King Gate Zero from his Deck to his hand. He then placed Zefraath in the Pendulum Zone and used the effect to kick Zefraniu, Secret of the Yang Zing from the Deck to the Extra Deck. He then Normal Summoned Ritual Beast Tamer Zeframpilica. Sandoval activated Ghost Reaper & Winter Cherries, revealing Heavymetalfoes Electrumite. Adams banished 2 copies and handed his Extra Deck over to Sandoval to look at. He then activated Supreme King Gate Zero, then Pendulum Summoned Chronograph Sorcerer from his hand and Zefraniu, Secret of the Yang Zing from the Extra Deck. He used Zefraniu, Secret of the Yang Zing’s effect to add Zefra Providence from his Deck to his hand, then used that to add Zefra War to his hand. He then used both Zefraniu, Secret of the Yang Zing to Xyz Summon Number 39: Utopia the Beyond then used that to Xyz Summon Gaia Dragon, the Thunder Charger. He then attacked with Gaia into Sandoval’s Supreme King Dragon Darkwurm for piercing damage, then attacked with everything else to leave Sandoval at 1600 LP. He set Zefra War and passed. Sandoval drew to 2 cards in hand and revealed that he drew another Ghost Reaper & Winter Cherries and was holding onto an Evenly Match. He extended the handshake! Zefras show their power once again as Kevin Adams takes a 2-0 victory! QQ: What’s Your Favorite Card In Legendary Collection Kaiba? 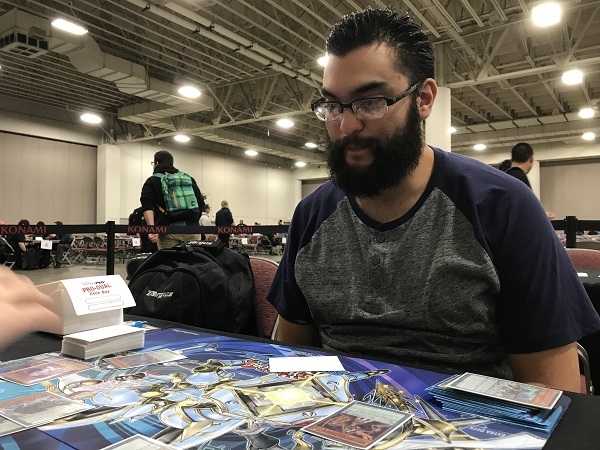 YCS Salt Lake City: Round 5 Pairings!